There is a German man who lives in Italian castle. Some people believe this man to have magical powers. And because of this, world media has to take note when he makes a statement, even if the statement has no bearing on life as it is lived now on this particular planet. I think it’s like when Carlos Santana gets a Grammy nomination, and everyone involved quietly acknowledges that the nom is a nice gensture even though Mr. Santana’s time has passed and his new music doesn’t have the impact the old stuff did way back when. But the pope’s most recent statement doesn’t only remind us how out-of-touch and backwards the Roman Catholic Church is but also indicates that Pope Benedict is just old, as it’s one of the most classic old people statements he could have made. The statement goes something like this: “Names aren’t good today! Your new names are stupid! You should name your kids good, old-fashioned names like they had in Bible times!” That is it, basically, with the addendum that children given names not drawn from the Bible or the list of saints are missing out on the Holy Spirit, which apparently prefers Josephs and Margarets to your flash-in-the-pan Carters and Addisons. To an extent, I agree with the pope’s line of thought. I would be a lot more likely to take seriously a person with a “normal” name, rather than one that seems very off-the-moment (Kaylee, Aiden), stripperish (Amberlee, Jaide) taken from vampire culture (Cullen, Sookie), or like a normal name spelled in the manner of someone trying to get ride of Scrabble tiles (Korynne, Jaysen). A lot of the most popular names of 2010 are actually old-fashioned names, and I’m more or less okay with that, even if I might want to name my child something that would decrease his or her chances of being reduced down to an initial. My name? Not that weird. But I made it through my formative years without every being Drew M. And I like that. Of course, the pope’s statement focuses more on the religious nature of baby-naming, and on this subject I’ve always been curious: Isn’t it true that if all Catholic children were only named after full-fledged, canonized saints, then there would never be a new saint with a new name? And even if one of those weirdos with a crazy, “new” name — like, say, Jennifer — converted to Catholicism, she should logically drop her pagan name and take a good Catholic one. She could have Jeonilla! After St. Jeonilla! Who was hung by her hair, lacerated and finally beheaded! No exaggeration: That list represents just only the saints celebrating feast days in January, and therefore is only one-twelfth of the bummer names the church would be okay with you calling a child. Lest Pope Benedict forget, unusual and decidedly non-Catholic names have been attached to many sainted and beatified people. Take Kateri Tekakwitha, a Mohawk-Algonquian woman who converted to Catholicism in the 1660s. Yes, she chose Kateri because approximated the Mohawk pronunciation of Catherine (as in St. Catherine of Siena), but the connection isn’t obvious and no one refers to her as Catherine Tekakwitha. (Also, she’s not St. Kateri yet, but Blessed Kateri, as she hasn’t yet passed the final stage of canonization.) It boggles me that Kateri could get the pope’s approval by virtue of a tangential relationship to Catherine while something like Jayden (lame and insubstantial as that name might be) couldn’t squeak by with the explanation that it’s a variation on James. And who knows: Maybe little Jayden will grow up to be a bringer of many miracles and a thousand years down the line the Robot Pope will be urging space parents to name their kid-pods after St. Jayden so they might always remember his sterling example. In closing, I’d like to say that this would be a rare fumble in what we can all agree is a pretty terrific record that the church has as far as interactions with children. 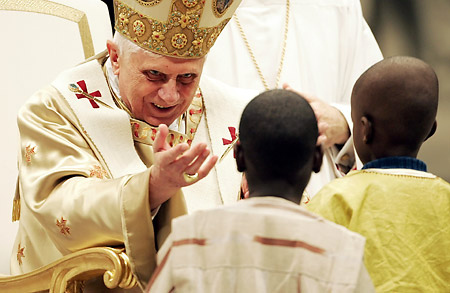 I'm sorry, but that is the most evil looking pope I have ever seen. Felician sounds like a nice name. Makes me think of Felicia from Dark Stalkers. Hmm...Fanchea. Sounds like some sort of yeast infection.